Sprayberry High School Football Season starts Next week – Sprayberry vs Kell! This game has been recently dubbed the Canton Road Classic by the North Cobb Business Association. Game is at Kell this year. Friends, Neighbors, and Alumni are encouraged to show your support! 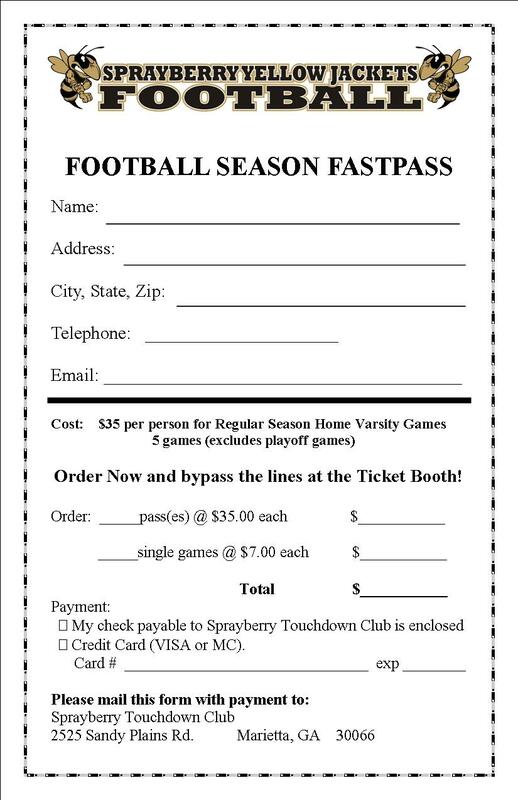 New to this year, Sprayberry is offering a Fast Pass for all Home games this season. No long lines. Just show your pass, get it punched, and enter through the VIP Gate. I want to also let everyone know that Sprayberry Football is raffling off a 2009 Jeep Cherokee. If you want a raffle ticket they are going fast. Your chance to win a new Jeep is only $10 per ticket. Stinger Cards are still available if you haven’t gotten one yet.